During the Second World War, the British government built several Fortress islands in the North Sea to defend its coasts from German invaders. Some of these forts were built illegally in international waters. One of these illegal Fortresses, consisting of concrete and steel construction, was the famous Fort Roughs Tower, situated slightly north of the estuary region of the River Thames, on the east coast of the United Kingdom. In contrast to the original plan to locate the tower within the sovereign territory of the UK, this fortress was situated at a distance of approximately 7 nautical miles from the coast. This is more than double the then applicable 3 mile range of territorial waters. To put it briefly, this island was situated in the international waters of the North Sea. The forts were abandoned in the early 1950’s and, due to their illegal construction in international waters in a time of world crisis, they should have been destroyed, to comply with international law. Except for the aforementioned fortress, similarly located fortresses were subsequently pulled down. The result of this was the portentous uniqueness of the fortress. Fort Roughs Tower, situated on the high seas, had been deserted and abandoned, res derelicta and terra nullius. From a legal point of view, it therefore constituted extra-national territory. In the early 60’s, Roy Bates, a Major in the British army, established a radio station, situated offshore on an abandoned ex naval fort named “Knock John”. The theory behind this location was an attempt to bypass the draconian broadcasting restrictions of the time, which permitted little more than formal broadcasting by the BBC. Roy’s station, “Radio Essex”, and others like it, were known affectionately by the media as “Pirate” radio stations, and were much loved by the British public, as they supplied everything that the BBC did not at the time, Pop music and amusing presenters. In the years than ensued, Roy fought an unsuccessful legal battle with the UK government, which questioned the legality of his occupation of said fort. It was ruled that “Knock John” fell under UK jurisdiction. Smarting from his setback, Roy weighed his options. Another abandoned fortress, Roughs Tower, identical in construction to the Knock John existed further offshore, and crucially, outside of the three mile limit to which the UK jurisdiction extended. Roy proceeded to occupy Roughs Tower, on Christmas eve 1966, with the intention of revitalising his dormant radio station. This was until he conjured a different plan entirely. After consulting his lawyers, Roy decided to declare this fortress island the independent state of “Sealand”, Claiming “Jus Gentium” (“Law of Nations”) over a part of the globe that was “Terra Nullius” (Nobody’s Land). 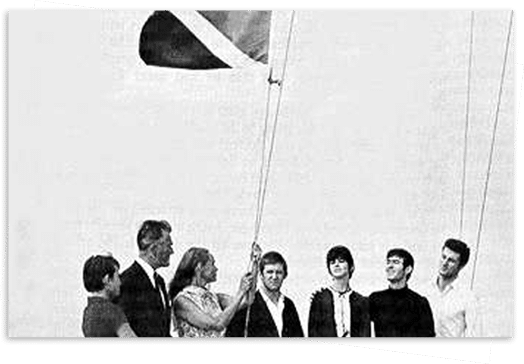 On the 2nd of September 1967, accompanied by his wife Joan on her birthday, his son Michael (14), daughter Penelope (16) and several friends and followers, Roy declared the Principality of Sealand. The founding of this country was marked by the raising a newly designed flag, and in an extremely romantic birthday gesture, the bestowing of a new title on his beloved wife, to be know from that moment on as “Princess Joan”. It was not long before the British Government decided they could not have what ministers described as a possible “Cuba off the east coast of England”. The military were promptly dispatched to destroy all other remaining forts located in international waters. The Bates family looked on as huge explosions sent the massive structures hurtling hundreds of feet in the air and twisted and buckled debris floated past Sealand for days. Helicopters that had carried the explosives buzzed menacingly above, and the navy tug carrying the demolition crew passed close by our fortress home and shouted “You’re next!” with an angry waving of arms. A while later a government vessel steamed to within fifty feet of Sealand, its boisterous crew shouting threatening obscenities at Michael, and his sixteen year old sister. Warning shots were promptly fired across the bow of the boat by Prince Michael, causing it to hastily turn and race away towards the UK, amongst a large cloud of black engine smoke. Since Roy was still a British citizen, a summons was issued under the UK ” fire arms act”. On the 25th of November 1968, Roy and Michael found themselves in the dock of the Crown court of Chelmsford assizes in Essex. There was much argument, and laws dating back to the 17th century were called upon. 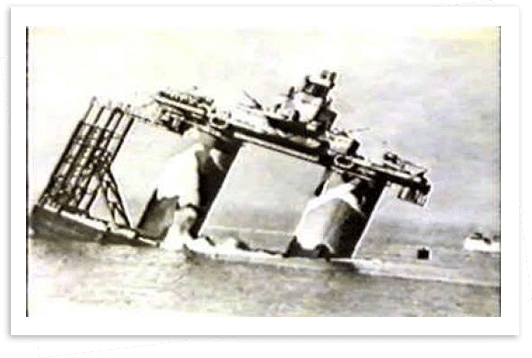 The judge concluded that “This is a swash buckling incident perhaps more akin to the time of Sir Francis Drake, but it is my judgment is that the UK courts have no jurisdiction.” This was Sealand’s first de facto recognition. Principality Notice PN 025/04: International Sporting Activities update.